The migraine headache is perhaps the best known special type of headache. Symptoms include dizziness, visual problems, “spots” before the eyes, swelling, tearing of the eyes, muscle contraction, irritability, nausea, vomiting, constipation, or diarrhea. These symptoms often arise before the headache hits. The pain itself may last for a few minutes to a few days, and the severity may range from minor discomfort to immobilizing agony. A variety of headache, closely related to the migraine, is the cluster headache. Attacks come on abruptly with intense, throbbing pain arising high in the nostril and spreading to behind the eye on the same side. Sometimes, the forehead is also affected. The attacks tend to occur from once to several times daily in clusters lasting weeks, or even months. Without apparent reason, the cluster subsides as quickly as it began. 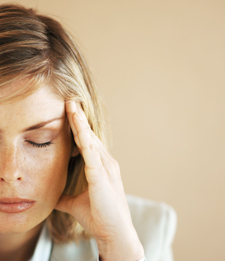 Migraine headaches can rob you of your life. Now, new imaging devices have allowed them to watch brains during migraine attacks, and scientists are discovering that sufferers have abnormally excitable neurons or brain nerve cells. We want to deliver nothing less than maximal results for migraine headaches. I take a different approach to the treatment and prevention of headaches and migraines. I address this condition by looking at both Metabolic and Neurological factors. It’s not enough to just shut the pain off you need to understand why the migraine is occurring so that you can prevent it from coming back. Don’t you agree? When those questions are answered, we can develop a targeted treatment approach, tailored specifically to your needs. If you would like to have more information or to set up a consultation and see how we can help you (or someone you know), give us a call at (305) 259-8755 to schedule an appointment to see if you are a candidate for these breakthrough procedures.